Last week I watched an over an hour webinar that explained the advantages of using preprints servers in scholarly communication. You can watch the presentation on YouTube1. However, If you cannot dedicate so much time, in this post we tell you about the topic in less than 10 minutes. Keep reading. 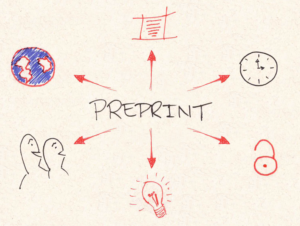 In scholarly publication, a preprint is a version of a manuscript prior to peer review that certifies or not its formal publication in a journal. The preprint is deposited by the corresponding author on a preprint server, usually thematic, following public procedures. The preprint version may be an advanced or an incomplete version, but mostly it is a final version. When using this service, authors establish a date as a precedent, may request comments and add suggestions to the manuscript that is subsequently sent to a journal’s formal editorial process. Physics and Mathematics researchers have already been depositing their research papers for more than 25 years on arXiv.org where over 100,000 manuscripts per year are uploaded and new areas and disciplines have been added to the repository, such as Quantitative Biology, Statistics and Quantitative Finance. Lately, new preprint servers are in operation in other areas or are in the process of being launched. The ASAPbio initiative, led by scientists, is actively promoting the use of preprints in Biology. Among others, we highlight, in alphabetical order, bioRxiv, ChemRxiv, engrXiv, Figshare, F1000Research, PeerJPreprints, PsyArXiv, SocArXiv and SSRN. The important thing is that all these preprints are fully indexed by Google Scholar, which provides them with immediate visibility among the research community. The Open Science Framework website also indexes all main preprints servers. Preprints servers are fully compatible with academic journals and, in fact, there is a large number of scientific societies, as well as journals (commercial and open access ones) that incorporate in their editorial policies the use of preprints servers by the author. At Wikipedia there is an article2 especially dedicated to the subject, where these institutions and their policies are listed, among them, the Nature Group, Elsevier, Springer, Cell, Science and many others. 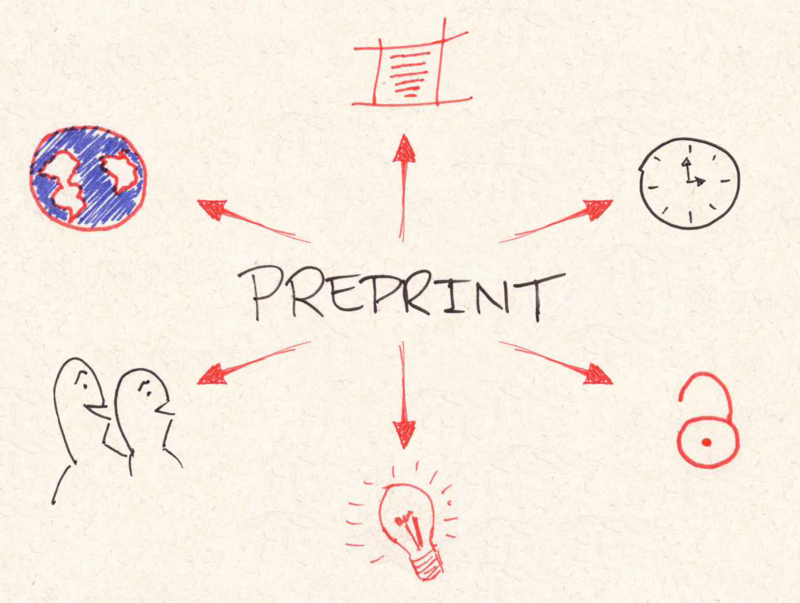 The ASAPbio website publishes a 4-minute animation that summarizes what are preprints. Immediate open access to the article. Public dissemination of recent and ‘invisible’ works, such as doctoral theses and fellowships. Receiving more feedback on your work from colleagues. Effective date when your research becomes public, to set priorities. Moving to the rhythm of science. Can we trust sharing our information before peer review? Actually, researchers are already sharing information about their work, for example, at conferences. Most importantly, the preprint publication provides an effective date that allows researchers to prioritize their part of the work. My ideas will be copied!!!! Because the preprints are available to the public, but they will not respect them. 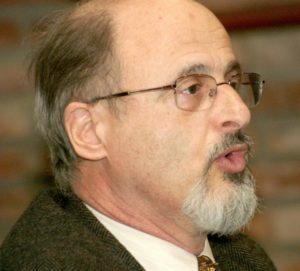 Paul Ginsparg, founder of arXiv stated3: “this should not occur, since arXiv postings are accepted as date-stamped priority claims”. “As responsible citizens of the scientific community, we will fairly cite original work presented as a preprint in our own scientific papers, just as we would cite a journal publication. We will acknowledge such work, as appropriate, in our presentations at scientific meetings.” ASAPbio Draft Statement. Preprints have proven to increase the number of downloads and hence the visibility of authors, their work, and eventually citations. The delay in the articles publication that causes great frustrations and priority complaints is significantly reduced. This is critical in the biological sciences, physics, chemistry, and the “research fronts” that are the burning issues today. Some institutions, for example, ASAPbio.org, in order to foster the preprints paradigm, promote actions to advocate the adoption of preprints by funding agencies, university selection committees and academic journals (Become an ASAPbio Ambassador). The generalized adoption of preprints will have consequences on the peer review function (whether blind or open review), but it will undoubtedly make it a more dynamic process. The role of academic journals in the scholarly communication process will change. Journals could well become stamps of recognition or reliable quality within a research area. It would be a good idea if the SciELO Program implemented a preprints server for the articles published by its circa 1,000 journals. Let’s wait for the news.